Working in conjunction with the Cambridge Network, Notre Dame High School in New Jersey welcomes students from a variety of global locations and encourages them to be a part of our unique community. We are a dynamic, diverse Catholic Community dedicated to educating young women and men to realize their full potential. Our college preparatory program includes 16 Advanced Placement and Honors courses in all subjects. We offer extensive co-curricular opportunities, including 53 athletic teams, with 27 varsity sports, more than 50 clubs and activities and an extensive visual and performing arts program. Academic high school classes at Notre Dame prepare students for entrance into prestigious colleges and universities, such as Columbia University, Cornell, Princeton, Georgetown, Harvard, University of Notre Dame, Providence College, Saint Joseph's and Yale, to name a few. In fact, 99% of graduating seniors go on to pursue higher education. Our unique location in Lawrenceville, NJ affords students exposure to the culture and events of local towns, such as Princeton, New Jersey. We are also within 60 miles, just a one-hour train commute, into New York City and Philadelphia, Pennsylvania. 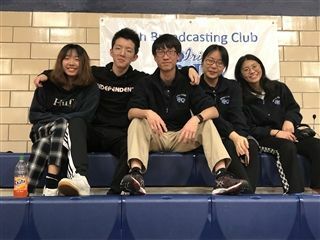 On February 1, members of the Notre Dame Broadcasting Club recorded the Boys Varsity Basketball game in their native language of Mandarin. They enjoyed it so much that they announced the Girls Varsity game on February 5! Click to hear their broadcasts. "Notre Dame is one of the preeminent Catholic schools in the United States."